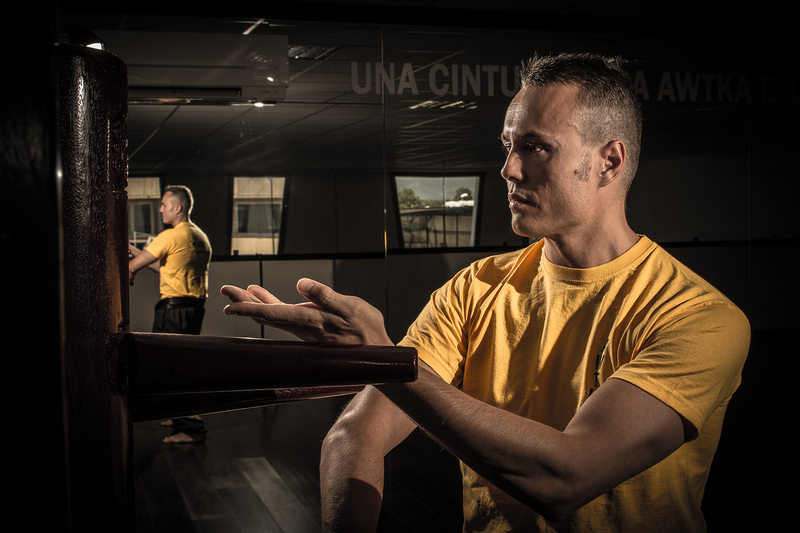 Sifu Nicola Colonnata begins to practice Martial Arts back in 1992, at the age of 13. His learning begins with Kick-Boxing but, like every true fan of Bruce Lee’s movies, his dream has always been to practice Kung-Fu. He meets on his path a Kung-Fu Shaolin teacher, whom he will follow for some years, but his revelation comes when, still a teenager, he meets for the first time Wing Tsun Kung Fu. The study of Wing Tsun Kung Fu becomes an integrating part of his life from the very first moment : he trains privately and with great effort for some years with his first teacher, Master Paolo Pasquini (who is a great expert of Kick Boxing as well), then he passes, as a private student, to Master Filippo Cuciuffo, Italy’s national MasterChief for EWTO. His will to learn does not stop though as, in 1999, once the Instructor Grade has been achieved, as a true researcher, he begins to travel around Italy and Europe, meeting great Masters along the road. Countless are the private lessons that he attends to in Italy; with Master Michele Stellato (AWTA leader), Master Cosimo My (EWTO), Master Stefan Crnko (Spain’s Chief Instructor for EWTO, MMA fighter), and Master Franco Giannone. Sifu Nicola also goes to Amsterdam, Holland, where he trains privately Wing Tsun with Master Frank Schafer, Netherland’s Chief Instructor for EWTO. His dream, though, has always been to learn Wing Tsun straight from EWTO’s great Masters. Therefore, he begins to study Wing Tsun privately with GM Kernspecht, EWTO’s leader. In 2005 Sifu Nicola sees his dream come true, and after getting his Master Degree in Law, he heads to Hong Kong where he has been accepted as a private pupil by GM Leung Ting, from whom he receives several private lessons, first Italian to have this honor. When he realizes that, in order to absorbe completely the system, he has to study it straight from the source, he manages with great sacrifices, to attend for several years to the tutorials that are held in EWTO’s general quarter, Langzell’s Castle, in Germany. The tutorials are almost exclusively for national Chief Instructors, being held by GM Leung Ting in person; this way, Sifu Nicola is able to review all the system from the naked hands of the Great Master. In Italy Sifu Colonnata teaches, as Master Cuciuffo’s assistant, in countless stages for WTOI instructors, where he forms the aspiring instructors and teachers from all over the country. In 2004 he founds, along with his brotherly friend Andrea, WT Living, a company that imports and deals books and for Kung Fu from all over the world. Thanks to this he starts relationships with masters from every part of the globe, relationships that will grow stronger and stronger throughout the years. In 2005 Nicola is named Sifu, becoming EWTO Europe’s youngest Sifu. This honor is for having carried one of his pupils to achieve the First Technical Grade. In 2006 Sifu Nicola achieves Third Technical Grade EWTO and First Technical Grade of Escrima Philippino, thanks to GM Bill Newman’s teachings. In 2009 Sifu Nicola reaches the Fourth Technical Level EWTO. Since 2001 he privately reviews all GGM Yip Man’s system, weapons included, with GM Sergio Iadarola, leader of IWKA, and begins to learn from him other Wing Chun lineages. In order to learn the system, he follows his master everywhere : Hollan, Spain, Germany, Lithuania, China, Hong Kong. Again, he travels other several times to Hong Kong, where he also begins to study with GM Cheng Kwong and GM Sunny So, Great Masters of Weng Chun. He plays the role of National Master Chief for Italy and Spain. In 2012 Sifu Nicola is awarded with the Master 5° P.G. in Wing Tjun Kung Fu title. In November 2013 he leaves IWKA. Sifu Nicola travels all the way to Indonesia to study with GM Tio Tek Kwi, and after being accepted as his private student , he reviews with the Gran Master all the system that, up to that point, he studied in IWKA; he then receives the authorization to teach and spread around GGM Kwe King Yang’s system, named 18 Lohan Hands, which is known, in the Martial Arts world, as the only system that teaches energy’s transmission. Today Sifu Nicola still studies Qi-Gong in Hong Kong under the supervision of a very able and experienced Sifu. He studied privately in Hong Kong with GGM Tang Yik’s great grandchild, GM Michael Tiang, who is considered “The King of the Long Pole”, with whom he reviewed all the system of GGM Tang Yik. In 2014 he founds AWTKA. (Authentic Wing Tiun Kung Fu Association). Today Sifu Nicola still studies Qi-Gong in Hong Kong under the guide of GM Chieng, specialized in this area, and keeps on digging further into Wing Chun, Weng Chun and the 18 Lohan Hands under the guide of his Sifus because his belief is that we are pupils for all of our lifetime and we never stop the learning. Sifu Nicola personally trains all the AWTKA instructors at the national academy in Marina di Carrara ; he holds intensive seminars in Italy and Europe in order to spread the Wing Tjun AWTKA system, which contains all of the teachings received from his masters during these years, with the goal of preserving the art and spreading it, both the martial part and the life values that it encloses.